A large telecoms group selling at the budget end of the market and providing broadband, calls, TV and mobiles. matching TalkTalk broadband deals available. TalkTalk broadband deals available. The Bottom Line: You pay £25.45/mo for 18 months, then £38.50/mo. The Bottom Line: You pay £30.45/mo for 18 months, then £43.50/mo. The Bottom Line: You pay £78.00 the first month, then £28.00/mo for 11 months, then £38.00/mo. The Bottom Line: You pay £32.95/mo for 18 months, then £48.50/mo. The Bottom Line: You pay £83.00 the first month, then £33.00/mo for 11 months, then £43.00/mo. The Bottom Line: You pay £83.95 the first month, then £33.95/mo for 17 months, then £44.50/mo. The Bottom Line: You pay £85.50 the first month, then £35.50/mo for 11 months, then £48.00/mo. The Bottom Line: You pay £86.45 the first month, then £36.45/mo for 17 months, then £49.50/mo. The Bottom Line: You pay £88.95 the first month, then £38.95/mo for 17 months, then £49.50/mo. The Bottom Line: You pay £90.50 the first month, then £40.50/mo for 11 months, then £53.00/mo. The Bottom Line: You pay £91.45 the first month, then £41.45/mo for 17 months, then £54.50/mo. TalkTalk started life in Leeds in 2003 as a subsidiary of Carphone Warehouse. In 2010 it split away and became its own company. Providing broadband, calls, TV and mobile services, TalkTalk is now headquartered in London. 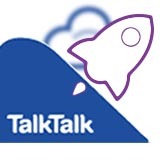 TalkTalk’s ADSL broadband with maximum speeds of 17Mbps is aimed at the value end of the market. Adding Anytime Calls to your broadband bundle will cost £7.50 a month. A full list of TalkTalk phone call prices is here. TalkTalk runs a mobile virtual network selling SIM Only plans. It uses the Vodafone network for voice calls and 3G data. As of November 2017 TalkTalk are not selling any new contracts and word on the street is that it will sell off its mobile arm to rivals O2 or Three. TalkTalk has its own on-demand TV services using the Youview and Youview+ Freeview HD box. There are two packages: TalkTalk TV and TalkTalk TV Plus. The basic package gives you the standard Youview Freeview box with which you can pause and rewind up to 30 minutes of live TV. You get 80 Freeview channels with 15 in HD. The more pricey TV Plus plan gets you the upgraded Youview+ box, which allows you to pause and record 90 hours of HD content, as well as rewinding up to two hours of live TV. You’re looking at around 150 channels in total, including premium entertainment like MTV, Sky One, Sky Two and Sky Living, as well as UK Gold and Comedy Central. Netflix is available as an app through Youview. One-month TV Boosts are also available. These are channel collections under the likes of Entertainment, Kids or Sports so you can try out Sky Sports for a month, or Sky Cinema, or Nickelodeon, Boomerang and Disney Channel. TalkTalk sells the same two kinds of fibre as every other provider using Openreach: up to 38Mbps and up to 76Mbps. These, like TalkTalk’s ADSL, are aimed towards the budget-conscious customer. If price is the single biggest factor in picking your next broadband provider then TalkTalk might work for you. Their TV Boosts offer a cheaper way to get Sky Sports or Sky Cinema on one-month contracts.